The name "Krugerrand" has been synonymous with wealth, prosperity and riches for more than 50 years. First issued in 1967, the South African Gold Krugerrand holds the title of being both the world’s first modern gold bullion coin – AND the most widely traded gold coin on the planet, inspiring similar gold bullion series around the globe. However, while other countries had produced silver versions of their bullion coins, collectors had only dreamed of owning official Krugerrand coins as pure silver bullion coins . . . that is, until now! 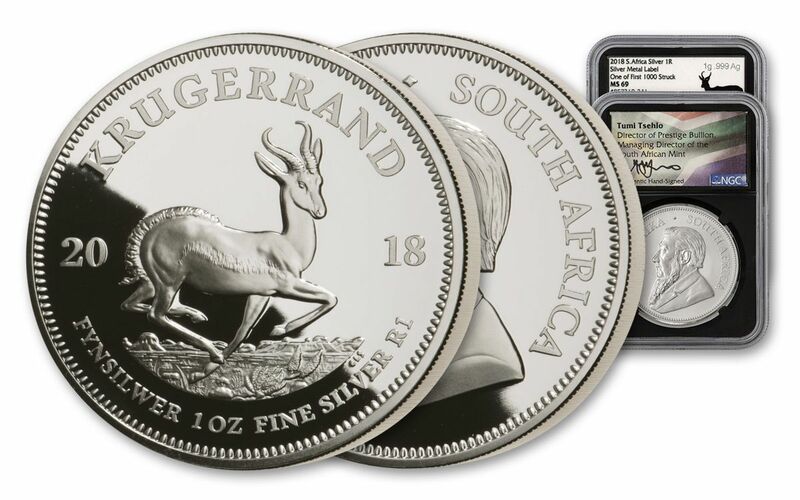 Now you can own one of the FIRST-EVER One-Ounce Silver Bullion Krugerrands struck by the award-winning South African Mint in a full ounce of 99.9% fine silver. 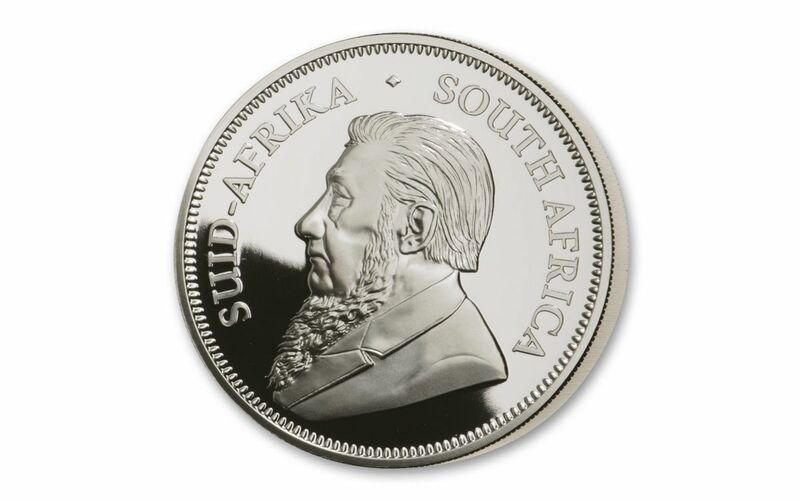 This silver bullion coin bears the same design as the original gold coin – former South African President Paul Kruger on one side and the iconic Springbok antelope on the other. 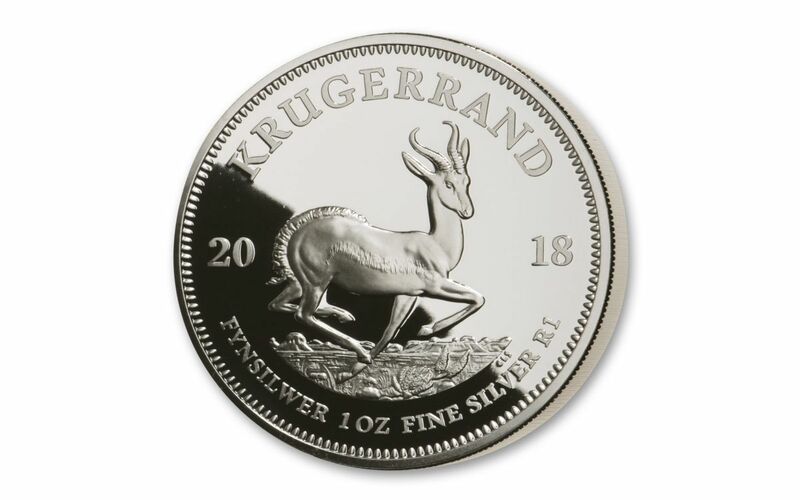 Your 2018 South Africa One-Ounce Silver Krugerrand has been graded by the Numismatic Guaranty Corporation (NGC) as being in near perfect Mint State-69 (MS69) condition, a distinction that means your almost-flawless coin will showcase an impressive full strike and indistinguishable imperfections – well above and beyond the quality of the vast majority of coins in the series. Your coin will also be certified by NGC as being one of the first 1,000 coins struck in the release – independent authentication that your Silver Krugerrand was one of the very first struck! In addition, your silver Krugerrand will come sonically sealed in an acrylic coin holder with an exclusive silver label that was minted in a full gram of 99.9% silver and personally signed by South African Mint Managing Director Tumi Tsehlo. Don’t miss your chance to own this first-ever issue – it’s like being first in line to collect the very first American Eagle or Canadian Maple Leaf silver bullion coins! Whether you've already brought a Silver Krugerrand home to your collection or you've been waiting to make one your own, now is the perfect time to join the party! But don't wait much longer – based on past history these coins will not last long. Reserve your 2018 One-Ounce Silver Bullion Krugerrand today! FAMOUS KRUGERRAND DESIGN STRUCK IN SILVER – South Africa’s famous Gold Krugerrand is now available as a silver bullion coin and features the same iconic designs! It’s the first year this popular coin has been available as a Brilliant Uncirculated bullion coin! LEGAL TENDER SILVER BULLION – Although silver Krugerrands are 1 Rand legal tender in South Africa, as bullion coins they carry no monetary face values other than their weight in silver. GRADED IN NEAR-PERFECT CONDITION – Your 2018 South Africa One-Ounce Silver Krugerrand has been graded by the Numismatic Guaranty Corporation (NGC) as being in near-perfect Mint State-69 (MS69) condition, a distinction that means your almost-flawless coin will showcase an impressive full strike and indistinguishable imperfections – well above and beyond the quality of the vast majority of coins in the series. KEY MINTING CERTIFICATION – Your coin will also be certified by NGC as being One of the first 1,000 coins struck in the release – independent authentication that your Silver Krugerrand was one of the very first struck! 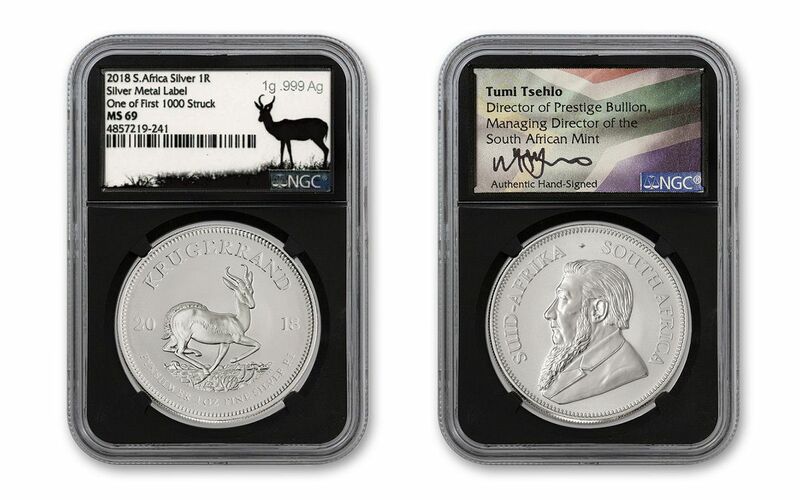 INCLUDES KEY MINT SIGNATURE – Each coin in this offer has been specially encapsulated with an exclusive silver label that was minted in a full gram of 99.9% silver and personally signed by South African Mint Managing Director Tumi Tsehlo. Don't wait to claim this global phenomenon for your collection. Bring the first-ever Silver Bullion Krugerrand home to your collection now!